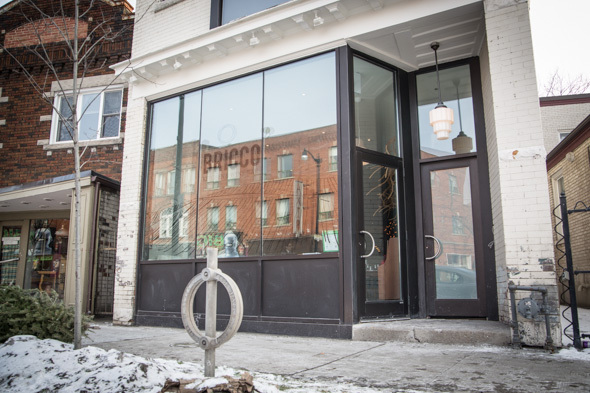 Bricco Kitchen and Wine Bar opened in the Junction in mid December. The name originates from the vineyard Bricco Vergne, situated on a large sloping hill overlooking the city of Barolo, and outlines the commitment to bringing the neighbourhood's oenophiles a place to hang out. 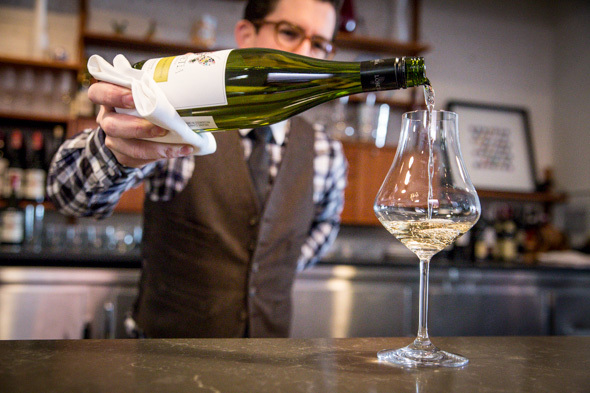 Owner and Sommelier Eric Gennaro (formerly of Crush Wine Bar ) grew up in the neighbourhood and wanted to create an elegant yet unpretentious dining spot, offering the food he grew up with: Italian and Mediterranean cuisine, with a focus on simple, clean, and bold flavours. To do so he teamed up with a former colleague, Chef Justin Zamperin (Crush, Buonanotte ). The two owners have succeeded in fostering a familial and relaxing atmosphere. The dining room mirrors this philosophy; the space is both refined and warm. 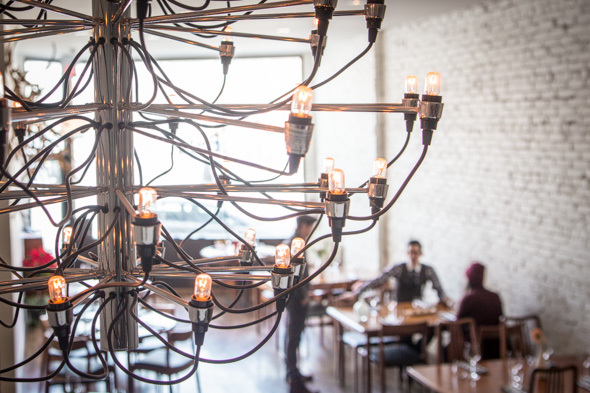 Though the menu is decidedly Mediterranean, the furniture and decor are pure '60s Scandinavia. Most of the items have been sourced from antique stores and collectors around the GTA, though there's a few complementary modern touches, including an ornate wooden sculpture made of reclaimed ash tree by talented locals Brother Dressler . 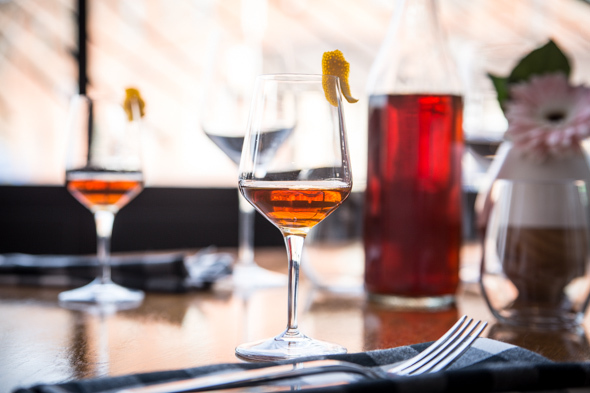 Bar Manager Max Romer ( Scaramouche ) has put together a short but smart list of classic cocktails, alongside a range of apertivos and digestifs, including a completely house-made amaro. A long list of ingredients including gentian root, black walnut bark, citrus peel, star anise and mint are all macerated in a neutral grain spirit. Even with an excellent range at the LCBO, this one stands out as unique. The result is a wonderful mixture of sweet, bitter and savoury. It's worth stopping in at the bar just to try this, but, given the menu, you might be inclined to stay for a few more treats. 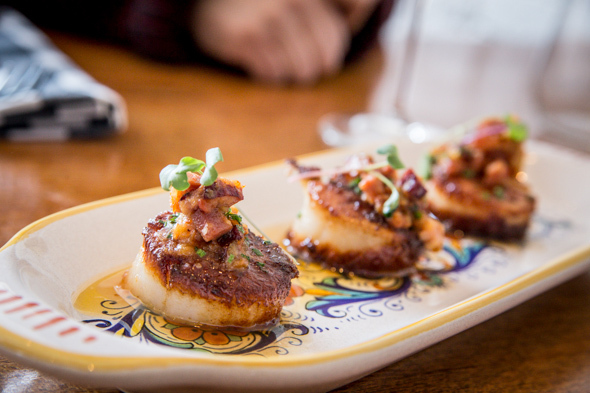 Scallops with bacon soffritto ($15) are three perfectly seared Nova Scotian sea scallops, dressed with a reduction of diced thick-cut bacon, celery, onion and garlic, and garnished with micro greens. It's a really nice balance of salt, sweet, and smokey. 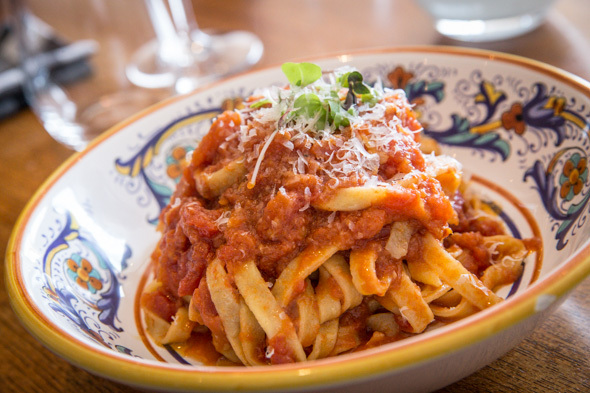 The tagliatelle with tomato and basil ($16) starts with fresh made pasta, with a sweet, slightly acidic, fragrant pomodoro e basilico sauce (composed of olive oil fresh and crushed tomatoes along with confit basil). It's all topped with fresh grated parmesan and micro basil. Finally, we tried the cornish hen ($20). 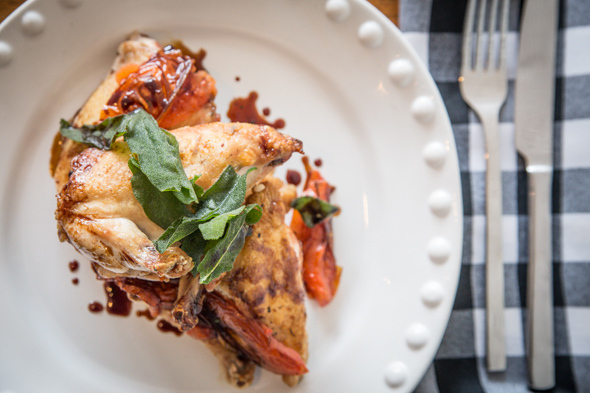 This small, single serving chicken is roasted with lemon before being accompanied by an accent of caramelized cherry tomatoes, a veal jus and crispy fried sage. The flavours blend harmoniously, but the dish really benefited from adding a side, so make sure to account for that if you're the kind to check the menu with a calculator. We opted for the 6 hour creamy polenta ($6). I've been really impressed with how serious restaurateurs have been spotting the opportunities in The Junction, rather than trying to cram themselves into already saturated markets like Queen West, and this effort doesn't disappoint - there's a huge amount of polish to the service, the wine list is well crafted, and the place is easy on the eye. Bricco Kitchen and wine bar is open, Wednesday thru Monday 5-10pm.